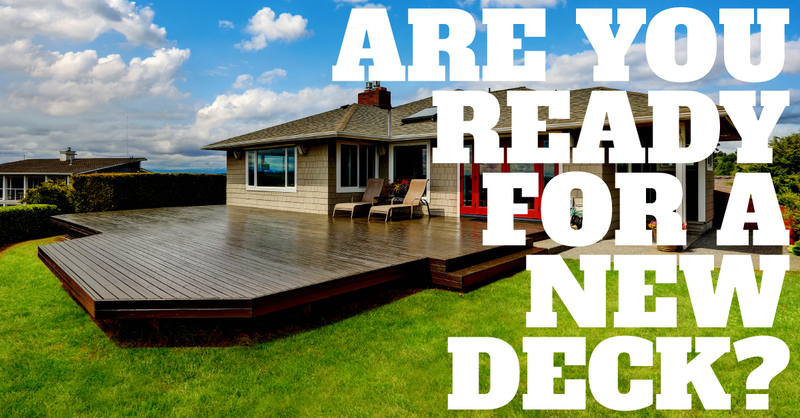 Home/Blog, Exterior, Outdoor Living/Are You Ready for a New Deck? If you’re like many other Des Moines homeowners, you head out onto the deck to enjoy the warm weather at every opportunity. The deck extends your living space, and it’s an ideal spot for grilling and entertaining, or just relaxing. Since the deck sits outside throughout the changing seasons, non-stop exposure to hot sun, pounding rain, ice and heavy snow are bound to make it deteriorate. Here are some telltale warning signs that it’s time for a new deck. Older decks often had the posts resting right on the footings, which allow them to absorb water and decay. If your deck feels unstable, it may be that the posts are rotting, especially if they’re not pressure treated. With a new deck, special brackets are used between concrete footings and the posts, so they resist decay and are able to hold the weight of the deck. If your deck is more than 30 inches above grade, a ledger board attached to your house is necessary to support the joists, posts and decking. If the ledger is just attached with nails or weakened by decay, the deck is in danger of failing and collapsing. A new deck will have a ledger board that’s attached flush against your home’s rim joist using lag or through bolts, so it’s sturdy and secure. Loose railings aren’t going to cause your deck to collapse, but they are a serious safety hazard, especially if the structure is high off the ground and there are young children in your household. If the railings are attached with nails instead of bolts or screws, they’re bound to come loose eventually. For a more secure connection and a safer railing, a new deck may have larger posts running continuously from the railing to the footings, or special steel framing connectors to reinforce the post attachment. With year-round exposure to the elements, your decking boards are going to weather and eventually begin to crack and split. Moisture can then seep in and speed up the deterioration – as they crumble and disintegrate, the nails or screws pop out repeatedly, and the boards become a safety hazard and need replacement. If you’re concerned about the condition of the deck on your Des Moines-area home, contact us at VanWeelden Company to schedule a free consultation and estimate for an expertly constructed and attractive replacement.